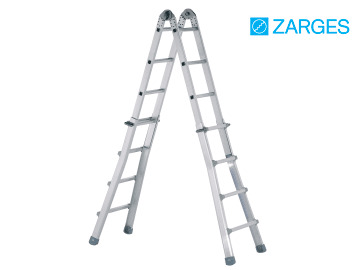 The Zarges Telescopic Industrial Ladder is flexible and stable - ideal for rapidly changing applications. It acts as 3 ladders in one; lean-to, trestle and staircase ladder. Only a few actions are needed to convert from one to the other. The ladder allows rung-by-rung height adjustment in all versions and features high-strength ZARGES quality flanged connection between rung and stile. It has an easy to use, automatic aluminium safety hinge, and has safe height adjustment thanks to four handles of diecast aluminium, providing excellent strength. 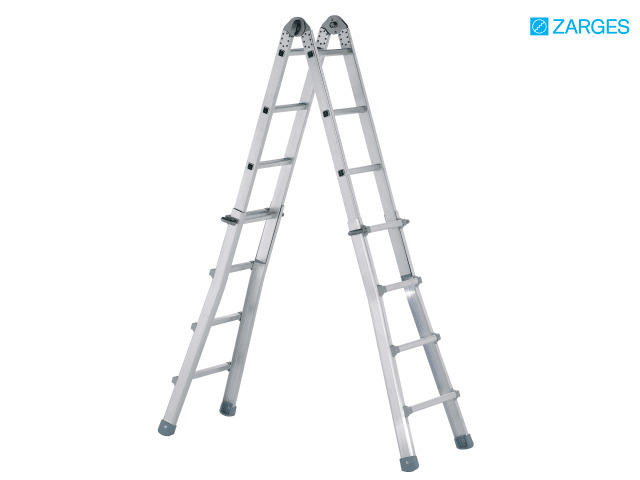 The telescopic ladder conveniently folds down to a space-saving compact size for transport. Number of rungs: 4 x 5. Dimensions folded: 0.63 x 1.58 x 0.21m. Length as lean-to ladder: 5.3m.